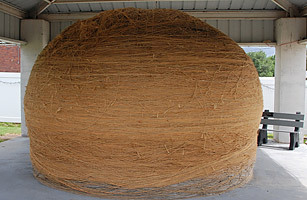 Anyone who thinks rugged individualism is the only way to make it in the American heartland has yet to visit the Largest Ball of Twine in Cawker City, Kansas. What began as an exercise in thriftiness for one farmer in 1953 has since been spun into a community project for the 500-person township in northern Kansas. Each year, a "twine-a-thon" is held on the third Saturday in August when anyone who wants can add more thread. At last official count, the yarn was the equivalent of more than 7.8 million feet and came in at 40 feet in circumference. While other balls of twine compete for the title of largest, Cawker City has long been looked at as the standard-bearer among twineheads. The sight to behold is located off U.S. Highway 24, in an area referred to by local officials as "downtown" Cawker City.